Hardwick Hall is a National Trust Property nestled on a hillside near Chesterfield in North Derbyshire. You can spot it from the M1 heading out of Derbyshire into Sheffield. Bess of Hardwick first created Hardwick in the late 1500s and her stamp on the place is very much there to see with the décor displaying her initials everywhere. We’d describe it as a typical Elizabethan property, full of dark furniture, serious looking pictures and huge tapestries. Much is also made of the fact that one of Bess’s many husbands was the jailer of Mary Queen of Scot (although she never actually stayed there). In the years since Bess left it’s been owned by various people, the most notable of which, before it passed into the National Trusts Hands, was the Duke of Devonshire. Keen eyed Harry Potter fans may recognise the place – in the first part of the Deathly Hallows Films, Snape apparates onto the front Lawn of ‘Malfoy Manor’. Hardwick was the house used, although a bit of CGI had been used to tart it up. Our favourite bit is the garden. There are big open green spaces and huge trees, but also flower beds full of colour. One section is also a vegetable and herb garden set out in a traditional Elizabethan style and, at its best, with everything growing is a thing of beauty. In 2012 a new café and shop opened in the former stables. This café is a big improvement on the previous pokey affair but on the day we visited was a bit disorganised. 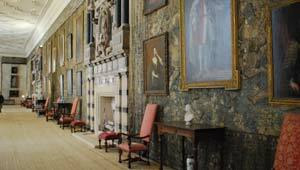 Hardwick Hall is open Wednesday to Sunday from 12noon to 4.30pm, except for the winter months when the house only opens at weekends. The gardens, restaurant, shops and park open for longer hours. Adult admission for the whole property is £10.45 (2012 prices) but is free for National Trust members.